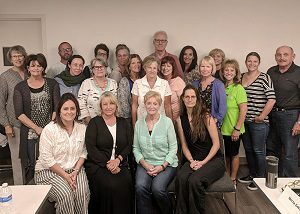 Our latest Parent Coach training took place at Utah Support Advocates for Recovery Awareness (USARA) in Salt Lake City last week with the help of our partners, Center for Motivation and Change:Foundation for Change (CMC:FFC) and USARA. During the weekend-long session, 16 devoted parents were trained through the CMC:FFC’s Invitation to Change Approach, an incorporation of Community Reinforcement and Family Training (CRAFT), Motivational Interviewing; and Acceptance and Commitment Therapy. The PhD-level trainers from CMC:FCC included Jeffrey Foote, co-author of “Beyond Addiction,” a science-based guide for families overcoming addiction and compulsive behavior. Following their training, the 16 new Parent Coaches will commit six months to providing one-on-one support to other parents in need over the phone. They will serve as a guide to other parents as part of the Partnership’s national network of Parent Coaches, listening to their struggles and offering profound advice. The next training sessions will take place in Philadelphia, Pennsylvania, Newark, New Jersey and Cincinnati, Ohio in the fall. For more information, or to register, contact Madison Moore at Madison_Moore@drugfree.org.